I don’t do this very often but there are so many amazing and exciting events coming up in the world of knitting, that I thought I would take a little space to mention a couple that stand out above the crowd. Have you guys heard about this one? Sock Summit 2009 promises to be a knitting event like no other! The list of instructors reads like a who’s who of knitting. The instructor list includes names like Lucy Neatby, Nancy Bush, Cat Bordhi, Meg Swansen, Cookie A, and Barbara Walker. The registration opens in May, so keep your eyes open and watch that site. I’m sure they’ll be flooded when the time comes. Oh how I wish it wasn’t so far away! I’d give my eye teeth to be there, even though I am NOT A SOCK KNITTER. I’d be one, just for that. So many knitters I admire, but the trip is more than I could do. Still I am hoping that many of my knit buddies will go and tell all about it. I can’t wait to hear. A Radical Act of Knitting in honor of Mother’s Day! “Calling all CODEPINK knitters! We are creating a beautiful, quilted cozy to cover the fence in front of the White House to honor Mother’s Day. The message will be “We will not raise our children to kill another mother’s child”-inspired by Julia Ward Howe’s Mother’s Day Proclamation. We’ll be piecing it together from individual squares knitted by YOU as part of the 24 hour Mother’s Day vigil for Women who live in War Zones. 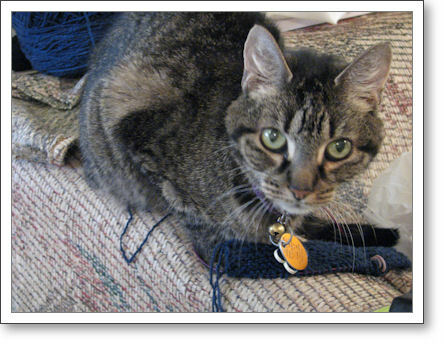 The best part is you don’t have to be an experienced knitter to help! This is perfect for knitters of all skill levels—and a great opportunity for those who want to learn! Celebrate the time honored tradition of the radical act of knitting.” Read more about this event here. This sounds easy enough that I think I will participate by making a square or two. I’m thinking of hosting an event in my hometown. I’ve never done it before but I will be talking to my knitting group this weekend to see what they think. Visit the Worldwide Knit in Public Day website to find an event near you! Anyway, back to the yarn! It’s Lisa Souza Superwash Merino in the colorway, Wild Things, which I’ve heard is inspired by the artwork in the classic Maurice Sendak story, Where the Wild Things Are . I just love the yummy blues and purples with the splash of earthy greens and browns here and there. Lisa is a real artist and I can thank some of my enabling yarny friends for leading me to her a few years ago. I’m pretty sure this yarn is destined to be another February Lady sweater someday. I’m probably going to change up the lace pattern when I do it in this color, and maybe make something that looks a little like dragon skin. How cool would that be? 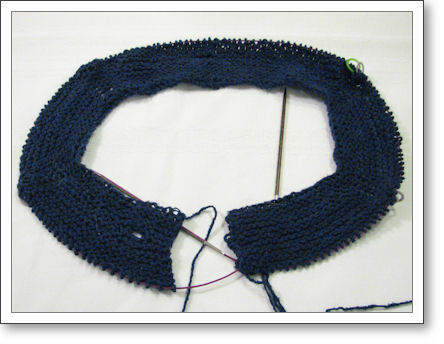 But I’m getting ahead of myself again… you know I’m only about 2 inches into the yoke on my current February Lady. But I’m always planning ahead like that. I keep telling myself it’s so when I’m old and retired I’ll have enough yarn to play with for the rest of my life. I think that’s the Yarn Harlot’s rationalization anyway, and I like it. It works for me. Ok, I’m off to take in a few more yarn fumes, then to bed. Didn’t sleep well last night. Hoping for better luck this time. Ciao! So, I don’t mind finding the occasional stripey cat hair in whatever I might be working on. When I do, it says, “Tegan was here.” Knowing that her remaining days are fewer than I’d like to think, this somehow brings comfort to me. I know I’ll be finding evidence that Tegan was here for many years to come. So this is what my February Lady Sweater looks like after just one week. On the one hand, it might not look like much, but on the other, you gotta remember that I am the self-professed slowest knitter in the world. So actually, this measly couple of inches is a huge feat for me. So here’s my first buttonhole. See? It looks a little funny. But I don’t think anyone will really notice, especially since the buttons themselves will be likely covering the buttonholes up. This morning I got up early, donned my “knitting uniform,” which today consists of my Ravelry hoodie and a mint green-colored t-shirt (Ravelry colored! 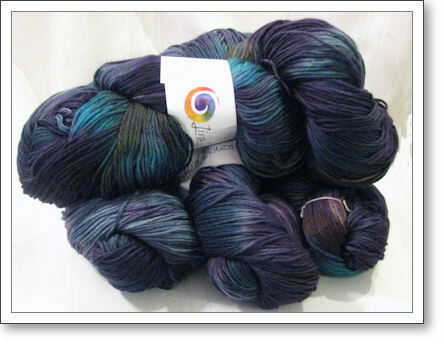 ), and prepared to sit and knit while listening to the new episode of Cast On. DH and Her Highness the Tween went to skating lessons and BoyZilla had a breakfast date with the grandparents. I was so looking forward to having the house all to myself. Next thing I knew, they were all coming home! Dang. I fell asleep and missed my “me” time. It’s pretty gray and icky today and I’ve been having trouble staying awake all day. Oh well, I guess some days are just like that. So, what are YOU doing this weekend? Anything fun planned? This is the view from my yard this morning, looking not much past my next-door neighbor’s yard. 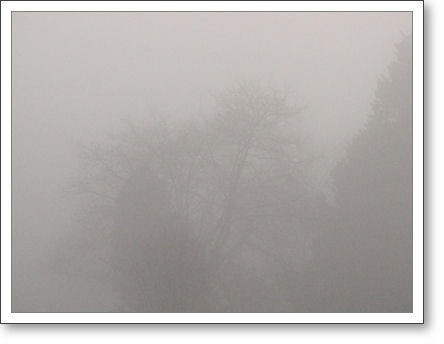 Every time I see a foggy day, I think of Carl Sandburg. “Fog” was the first poem I ever had to memorize. It was third grade, in Mrs. Goldstein’s class. So on this dreary, gray morning, here I sit with a mug of tea, brewed VERY black for extra punch, trying to gather what’s left of my energy for this last work day of the week. The fog of course isn’t helping my energy level. My toes are still cold and I’d really just rather crawl under the blankets and sleep til noon. This kind of gray, damp weather really doesn’t lend itself to a high energy sort of workday! But at least I know that the grayness of my sky is a small sacrifice compared to what the folks along the Red River must be going through right now. I suppose I’d take a little fog any day over that. Thankfully, there’s a bit of knitting time before I have to sign on for work. I’d better get to it, before it slips away. Happy Friday! Here’s hoping for a sunny afternoon.